25 years ago this month we founded Rocket to help companies exceed their business and technology goals with software that matters. We’ve never lost sight of that mission, and today I’m excited to announce the launch of our newest business intelligence product, Rocket Discover. Rocket Discover is the result of hard work by Rocketeers all over the world who met with many of our customers and partners to create a self-service, intuitive, data preparation and discovery solution that gives business managers and executives the information they need to make key decisions quickly and confidently. 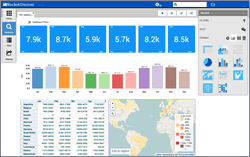 This new solution for accessing and enhancing data, and creating dashboards for business insights, shrinks to just minutes from what used to take days or even weeks to finish. You might be wondering why the world needs yet another BI product. Based on your feedback, we created Rocket Discover with critical functionality you required – including access to all Mainframe data and simplified data discovery and preparation. For optimal performance, Rocket Discover was engineered from the ground up for cloud, mobile, social, and big data. Rocket Discover includes a data-retrieval architecture that combines in-memory performance with live query access, a hybrid approach that can handle today’s massive amounts of data. Today’s business professionals know that they need data from multiple sources to assess and resolve their business challenges; Rocket Discover gives them exactly what they need, when they need it. Our emphasis on intuitive design for self-service data preparation and discovery makes this possible. Users can easily interact within a rendering canvas to create visual data process flows and dashboards through simple drag and drop movements. And when it’s time to collaborate with team members simply drag a dashboard into the chat window for immediate dialogue on strategy and opportunities. We are proud to introduce a product that takes our portfolio of BI products to a new level and gives our customers and partners the edge in a fast-moving, competitive market. The feedback we’re getting from our early Rocket Discover users reinforces our stance that this innovation is a game-changer. And we’re not stopping or slowing down our R&D investment: future releases coming this year and next will include additional features that will further maximize its value. I invite you to learn more about Rocket Discover here.